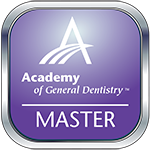 Get complete care with the array of available services from San Marcos Gentle Dental! To help you alter the appearance of your smile, Dr. Donnelly can help you select one of our cosmetic dentistry services. We have porcelain veneers to help conceal chipped or misshapen teeth for a wonderful aesthetic. For patients who would like to brighten their enamel, we may recommend a teeth whitening appointment with Zoom! whitening. For a completely renovated, refreshed look, you could even combine these beneficial services! Speak with our team today to decide which of our services is right for the new you. Are your teeth misaligned? Patients with crooked teeth will have a harder time performing routine at-home care, which can leave them susceptible to problems with dental decay. Additionally, this can affect a patient’s overall self-confidence. To help preserve your bite and your confidence, Dr. Donnelly may be able to use Invisalign clear aligner trays. This service works by shifting teeth into their proper place without the use of awkward metal braces. 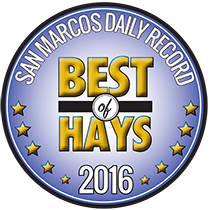 We can recommend this service any time you’re receiving care at San Marcos Gentle Dental, or you could call to schedule an exam. Believe it or not, there are a few dental problems that take place when you’re asleep! Patients who have high levels of stress may have TMJ problems like grinding teeth during sleep. Our TMJ therapy services can protect your teeth while you sleep, and prevent your jaw from becoming cracked. Do you have a snoring problem? You may need sleep apnea therapy services to help correct obstructive sleep apnea. This disorder can be extremely detrimental to your overall health, so it is important to have a professional like Dr. Donnelly evaluate you. Would you like to replace a missing tooth? With our dental implant services, Dr. Donnelly can completely recreate your tooth down to the root! We’ll check to make sure that you have adequate levels of bone density and gum tissue in the area, and then proceed with remaking your smile! Please contact us today if you would like to schedule an appointment for any of our dental services. Dr. Donnelly treats patients with our services from all over Texas, including the cities of San Marcos, New Braunfels, Kyle, Wimberley, and the surrounding communities. If this will be your first time at our practice, we ask that you please briefly review our new patient information, which we have posted for your convenience. 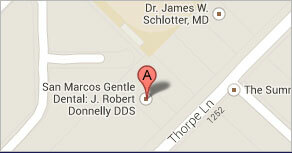 The team of San Marcos Gentle Dental is ready to help you improve your oral health!